Psychiatric nursing practice has changed dramatically over the past decades to accommodate vast changes in our health care system. The patients who now meet the level of care standards for an acute care setting have to be very ill and typically exhibit considerable behavioral impairments and multiple safety issues. This handbook for psychiatric nurses and nursing students reflects these changes and focuses on four particularly challenging aspects of acute psychiatric nursing practice: keeping the patient safe, stabilizing symptoms, promoting engagement in treatment, and discharge planning. In a systematic, easy-to-access format, the book offers proven, clinically useful interventions designed to modify and manage disruptive patient behavior. 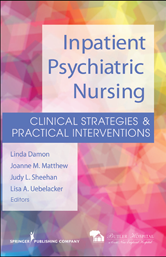 Also included is a chapter on overcoming one's own barriers to effective nursing in the difficult psychiatric environment.This important interdisciplinary clinical resource grew from a forum of Butler Hospital nurses who convened over a two-year period to identify and explore successful interventions used in the inpatient psychiatric acute care setting. The guide represents a collaboration between these health care professionals and their colleagues at the University of Rhode Island McLean Hospital, New York Presbyterian Hospital, and the Institute of Living.